I miss the built-in bookcases of our old 1930's apartments and long for some of my own again...someday. It would be so nice to unpack all those boxes of books sitting in our basement. It's a cryin' shame to keep them all cooped up. In the meantime I will make do with what I have and look to these images for inspiration. 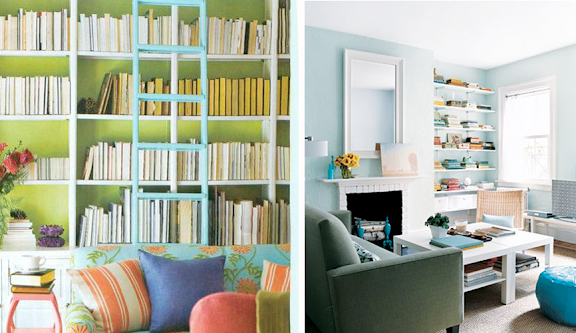 Grouping books by color...and love the idea of hanging art on a bookcase. Can't find an end table you love in your budget? Use a stack of books! 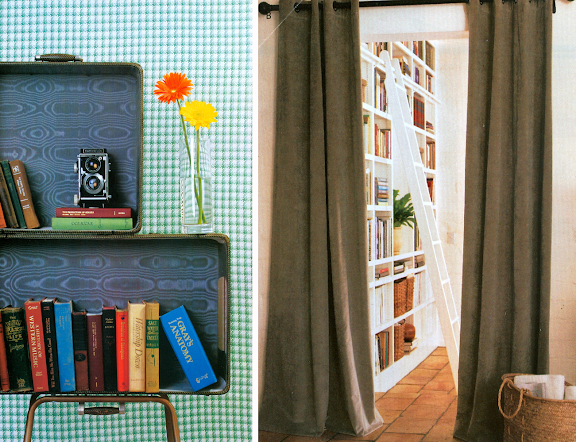 Also love the idea of displaying a large book with particularly lovely pages on a console table or sideboard. The perfect solution for not-so-pretty books (including paperbacks that have seen better days)--display them turned around, spine showing. If they were books you didn't care to reference, but couldn't bear parting with, it's a good solution! And this apartment featured in Living a handful of years ago has never left my mind. It's gorgeous in every way and I love the way the books are displayed on simple, white shelves and below the coffee tables as well. 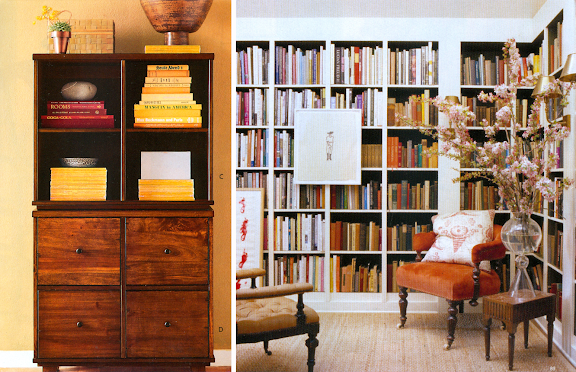 I simply ADORE floor-to-ceiling bookshelves packed with books of every size, shape and color. I've seen the "books as end table" solution before and have loved that as well. We have kind of a similar thing where we took a smaller, square trunk and stacked it with a few great coffee table books. So fun! We are building a home right now and bookshelves are on my mind as well. Hoping to include some builtins. Love your suggestions and photos- eps arranging by color and size. feeling your pain in the built-in bookshelf department. And in the rubbermaid bins full of books in my storage room. boo. My favorite part of our 100-plus-year-old house is the built-in, floor-to-ceiling bookshelf. I finally have a place for most of my books! I do love all these other ideas you've posted here, and I've been toying with the idea of rearranging my book display to add a little bit of visual oomph, so these provide some great inspiration. Thanks! Thanks Steph, I love the ideas. I use books as decor in every single room of my house! I love the color and inspiration they add. 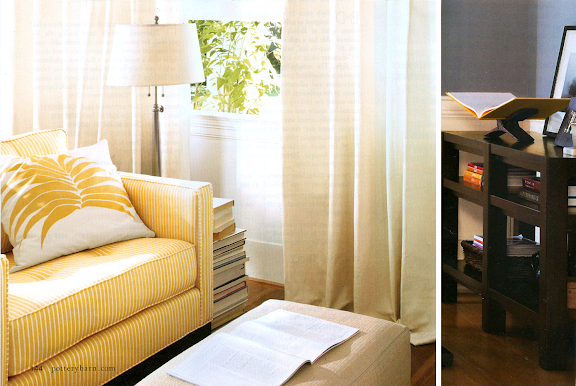 I think books make a house a home :) Any idea where that great yellow and white cushion in the second photo could come from? Gorgeous!